A workplace should be a place which consists of an environment to inspire a person to deliver their skills and abilities for the overall development of the company and their professional growth. A company is where an employee or employer works together for the development of their professional satisfaction. There is a possibility that an employee working in a negative environment faces trouble while delivering his/her duties and responsibilities. 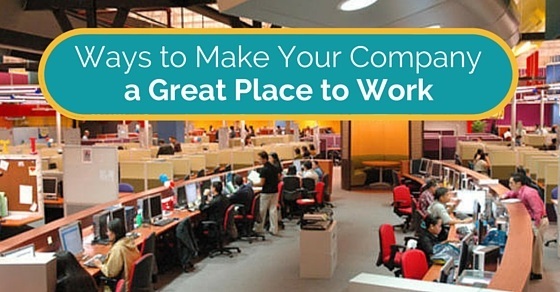 Here are the best tips on making your company a good place to work. The work environment is an important factor for the organization productivity. A good work environment is directly related to build a better place to work. Better workplace encourages employees to work efficiently, thus helping the company to achieve success. Having a clear vision and mission. Seeking honest feedback from employees. Moreover, happy employees turn out to be an asset for any organization. So it is very important on the company side to make their employees happy. 1. Encourage transparency and clarity. Some of the things which help or create a positive environment among employees and the employers are listed below. It is necessary to understand what makes your company a great place to work and how to make your company better. It is very necessary to make an employer feel good about his / her working environment and to make that happen an employer need to start encouraging employees of his / her office so that they can work in a better manner. Therefore, it is very much necessary to encourage the employees of the company, through some kind of professional encouragement such as promotions or performance appreciation. All these things help an employee feel better or great in a company. A company is where all the employees and their employers work together and deliver their duties with responsibility. It is possible that these deliveries of duties will be benefited if they try to learn something from each other. There may be some kind of situation when an employer might have acted maturely to handle such a crucial situation and these all incidents can help an employee learn from his / her employer for the better future. Working in a great environment may take some kind of positivity among employee and the employers, but actually, the truth is that this can happen by some kind of healthy competition among these employers and their employees to perform better in their duties. There may be a possibility that these competitions can be brought in, to set an achievable target for the financial year-end competition. This kind of competitions is commonly held in the marketing or sales department for some kind of encouragement. There is a common kind of mistake that most of the employees deliver while they are working in the office. For example, an employee only communicates with his / her fellow department staff and never tries to communicate with other department staff. This kind of behaviour can make things very limited for that particular employee. Therefore, if an employee tries to mingle or communicate with other staff members of the office, then there is a possibility that an employee ends up having many fellow employees in the company. There are some of the companies who conduct some kind of fun acts or events in the office on the occasion of various functions. And it will be advisable if all the employees of the company take part in such events either as participants or as volunteers for the successful completion. Therefore, all these kinds of efforts can create an environment which will be favourable for all the employees of the company to feel better in their company. If an employer or an employee needs to feel good in their company then there is a simple thing which they can perform for the healthiest relationship with their company. There may be a possibility that an employer who is a junior starts disrespecting a senior employee for some reason and that builds some kind of negativity for both the employees of the company. Therefore, to avoid such tension between employees, an employer needs to communicate with them to resolve problems and create a healthy start for their own good. This is very common in every company that most of the employees or the employers of the company expect some kind of performance appreciation from their higher authority so that they work better in their department. Therefore, to deliver such expectation in the office, the higher authority needs to consider employee performance appraisal to encourage and work better in their department. To make a company a place where all the employees of the company feel great to work together, an employer needs to build some kind of image that can help other employees to show some gratitude towards support they received in the office. Sometimes it happens that most of the employees don’t involve in each others work, but when there is a crucial time in the department, they need to support each other and thus the support provided should be appreciated for the goodwill of the company. A healthy competition among employees can create a healthy sportsman spirit within every employee, but there may be some employees who try to start delivering their political knowledge in the office. Some employees play politics between the employer and the employee so that there is some kind of misunderstanding created between them and ultimately that employee can benefit from that kind of company politics. Such company politics can ruin a healthy environment of the office. In most of the company, employees experience some kind of communication difference between their employers because of their position or attitude. Therefore, that may be a possible reason for such kind of imbalance in the company where all the employees feel negativity in their company. And to avoid such negativity an employer needs to keep in mind that all the staff members of the company are equal when it comes to their service delivery. Every employee of the company has their own career expectations and there may be a possibility that it will differ from person to person. Some of the employees have a higher expectation from their career and for that, they even work hard in their department. Therefore, this kind of hard work or analyzing the ability of better career can help an employee to plan his / her future development in the company. And that can create an external force which seems to be positive for their career. There are many companies who don’t believe in diversity in their company or department. And it is even possible that most of the people working in the office don’t approve their authority as a female. Sometimes it happens that during interviews, employers ask candidates about their point of view when they realize their higher authority holder is a female or a lady. This kind of gender discrimination can bring some of the negativity in the company. A company where all the employees work their duties for the overall development of the company need to understand one thing that they are a professional family and whatever problem they face in their department, they need to be helpful to each other. Not just the office environment, even an employee needs to invest in some kind of effort to make their workplace to be better for everyone. Sometimes it happens that some employees fail to perform their duties and try to create some kind of problems among others. This kind of behavior of an employee creates some negativity in themselves and it can ultimately make things worse for him/her in the office and then, unfortunately, he/she might end up getting fired from his / her duties. Most of the companies expect from their employees or employers to support them in their organizational decisions. And most of the time it happens that some of the employees or employers disagree with the decision taken from the company. But instead of acting irrational, those employees can give some thought over such decision which can benefit each of them in their best career and eventually there may be some kind of problems but finally it will be over. A successful company needs to understand that the secret behind the development of the company can be the innovative ideas about some of the products. These innovative ideas can create change in the business market. And eventually, all the employees of the company start feeling secure in their departmental duties assigned. Therefore, a company should be easy with their innovative ideas for the overall development of the company and their staff. Working in a company may seem like a tough job, but once an employee tries to understand his / her duties, then it will be no more considered as a tough thing to do. A working environment in the office can differ from day to day for some or the other reason. To avoid this all the employees need to be sincere and disciplined in their assigned work. To release some tension from office work and duties, a company can conduct some kind of stress buster activity for their employees and there are some of the companies who follow such activities to make their employee feel better in their company. There may be a possibility that most of the company which uses such stress busters have the highest rate of great working employees in their office. Therefore, it is very necessary to understand the value of such stress-busting programs. Time management is an essential part of any company. And this should be followed very strictly in all the companies. It is necessary to understand such time management abilities in the office. There are some companies which follow some strict rules in the name of time management and they put their employee, such busy schedule that they end up experiencing unwanted situations in the office. Therefore, to avoid such tension, a company needs to follow reasonable time management procedure for the welfare of the company. For example, an employee who is very new to his / her office and nervous about his / her duties, it is possible that he/she may feel nervous to be around such highly qualified people. At that time he/she need to create an impression where he/she can be presented as a friendly person that can happen only by his / her skill to impress all the staff members. This first impression of his/ her personality can make things better or worse for him/her in the office. In order to maximize the efficiency of employees, managing a good work environment is mandatory. Here are 18 tips that improve employees workflow and boost up creativity. 4. Have only what you need around you. To conclude, we would suggest all the employers and their employees that make a company a place where all the staff members experience greater happiness, then there should be one thing that needs to be delivered and that is understanding. An employee working in the company can feel better in his / her working place only if he/she feels secure with their career options. Therefore, if a company needs to understand the reason behind such difference within the company, then they should consider following all the mentioned reasons or causes for such unhappiness in the company. And they can start following all the above-mentioned steps to make their company a great place to work.